WATER MILL, NY -- (MARKET WIRE) -- March 21, 2007 -- WindmillKids has added a collection of hand-smocked children's swimsuits to its popular line of children's clothing. The swimsuits, a WindmillKids.com exclusive, are now available all year. The collection features trunks for boys and two-piece bikinis for girls in sizes 6-months to six. Families who live in warm climates, or head south for vacations at the beach, can find a great selection of warm-weather kids clothing at WindmillKids.com throughout the year. Sue Clarke, founder of the popular online children's clothing store, explained, "We receive a lot of requests throughout the year for kids' swimsuits, so we decided to make this very cute swimsuit collection a permanent part of our hand-smocked line of children's clothing." The girls' two-piece bathing suits, available in classic seersucker, gingham, and cotton tropical floral prints, have traditional hand-smocking on the bikini top and a ruffle on the bottom. The boys' swim trunks, also in classic seersucker and gingham, have a distinctive embroidered detail on the leg. 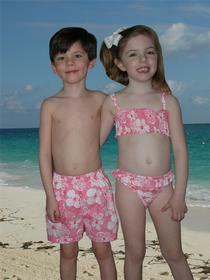 Boys' tropical floral prints are also available for those looking for matching brother-sister suits. The swimsuit collection is value-priced from $15 to $23.50. Sue and David Clarke, parents of five-year old triplets Emma, Mathew and John, were inspired to launch WindmillKids when they discovered how challenging it was to find quality made, hand-smocked children's clothing at reasonable prices. "Twins and triplets look especially cute in matching smocked outfits, so we are delighted that WindmillKids clothing is sought after by parents of 'multiples.' As we well know, these parents have no time to go out shopping for their children's clothing. An online source is a great option for them and a perfect family business for us. Mom does the merchandising, Dad handles the technical aspects of the business, and the triplets model the clothing -- until they outgrow the line, which is coming very soon," added Clarke.